Following the latest round of talks on the Ukraine conflict, foreign ministers from Russia, Ukraine, France and Germany have once again called on the sides to immediately agree to the withdrawal of heavy weaponry from the frontline and implement all the points stipulated in the Minsk peace agreements. Russian experts say that achieving a peaceful settlement in Ukraine remains possible, but note that there are also a number of reasons why the parties involved may not be interested in this. The foreign ministers of Russia, Germany, France and Ukraine have reiterated calls to the parties in the ongoing conflict between government troops and Russian-backed rebels in the Donbass region of eastern Ukraine to respect the terms of the ceasefire signed in February, as fighting continues in several areas along the frontline. After more than three hours of talks in Paris on the evening of June 23 again saw no real progress on resolving the impasse in Ukraine, Russian Foreign Minister Sergei Lavrov said that the ministers had mainly spoken about how Kiev can establish a direct dialogue with the rebels. German Foreign Minister Frank-Walter Steinmeier announced that substantial time during the talks was devoted to understanding who is guilty of violating the ceasefire. 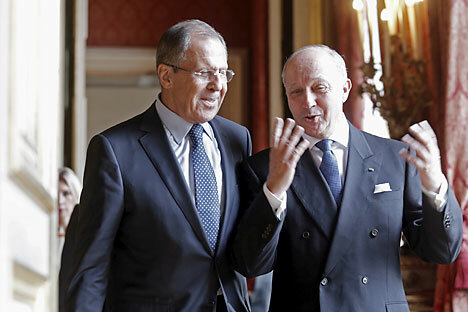 His French counterpart Laurent Fabius said that the foreign ministers had called on the sides to reach an agreement on the withdrawal of tanks and other heavy weaponry out of the conflict zone by June 26. In turn, Ukrainian Foreign Minister Pavel Klimkim remarked that there are three determining issues: the ceasefire, the exchange of prisoners and the elections in the rebel-controlled zones in accordance with OSCE standards. Fighting has been going on in eastern Ukraine since spring 2014, when local militants seized a number of key cities in the region after former president Viktor Yanukovych fled Kiev in the wake of a popular uprising in support of closer ties with the EU. The rebels, who claim to be seeking greater autonomy from what they see as an illegitimate government in Kiev, initially suffered repeated defeats against the Ukrainian army, but have since pushed government troops back in a series of stunning successes, widely believed to have been achieved via Russian military involvement, though the Kremlin officially denies that it is a party to the conflict. According to Dmitry Danilov, director of the European Security Department at the Russian Academy of Sciences’ Institute of Europe, the meeting in Paris was yet another attempt to prevent the Minsk process from slipping away, as increasingly frequent violations of the truce threaten to intensify the situation in the Donbass and derail peace talks completely. Earlier, in the beginning of June, fighting took place in the Donetsk suburb of Maryinka, which was reported to have resulted in deaths of several dozen people. Meanwhile, daily shooting is continuing along the frontlines in the region, with each side blaming the other. Danilov remarked that concrete measures for improving the security situation proposed during the meeting include the demilitarization of Shirokino (a village in the Donetsk Region that recently has been the site of clashes between Ukrainian government troops and the rebels) and the guarantee of an effective control of the ceasefire regime with the help, first and foremost, of the OSCE mission. Danilov believes that there are still grounds for moderate optimism for a peaceful solution to the Donbass conflict, despite the daily announcements of skirmishes and shooting. This can be deduced from the fact that negotiators are continuing to make important efforts to reach a lasting peace settlement. He also links the hopes for a peaceful solution to the work of control mechanisms in the conflict zone, such as the OSCE mission and the control commission, which includes Russian and Ukrainian representatives. It is located on the demarcation line and is supposed to verify whether or not the Minsk agreements are being abided by. Are sides still gambling on a military solution? On the same day as the meeting in Paris, June 23, the Contact Group on Ukraine, composed of Russian, Ukrainian, OSCE and rebel representatives, met in Minsk for a fifth round of talks. There were no breakthroughs in the Belarusian capital. However, it was decided to intensify the work of the sub-groups on certain political issues, a suggestion made by the OSCE. A sub-group in Minsk discussed the issue of elections and special status for the Donbass within a federalized Ukraine, while another sub-group on humanitarian issues is preparing the exchange of prisoners. At the same time there is a sense that neither negotiations with the participation of France and Germany nor the contact group will achieve any serious results until the conflicting sides – Kiev and the self-proclaimed republics – lose the temptation and possibility of realizing their objectives militarily. Alexander Khramchikhin, deputy director of the Institute of Political and Military Analysis, a Moscow-based research NGO, believes that the current form of the conflict, with fighting on a reduced scale, is a consequence of the influence that other players have exercised on the sides. In his view, there is no further escalation because "no one wants to start [a full-scale offensive] first."